Our Quick Trip (1.5 hours on the water), is perfect for those who want to try a new experience, or who want to get out and enjoy themselves on the river but don't have a lot of time. You'll start your 2.5 mile trip at our shop and float the Smith river to the Dan. Enjoy the wild flowers and wildlife (you will be sure to see ducks and geese and might see an osprey or bald eagle). White Water Specials Spray Dam to 3RO (1 mile - third Saturday mornings - depending on water level) Try some fun Class II white water! 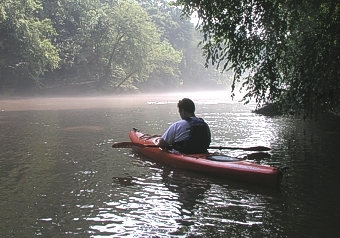 We provide sit on top kayaks and shuttle for this great little run. Or bring your own boat and use our shuttle. Check out the Class IV play spot for the experts!